Why would you html encode? To avoid cross site scripting attacks, all output is automatically html encoded in mvc. We will discuss cross-site scripting attack in a later video session. Consider the following custom Image() html helper. Notice that, this custom Image() HTML helper method returns string of type, IHtmlString. 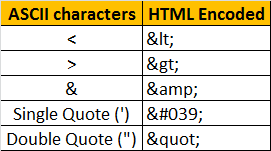 Strings of type IHtmlString are excluded from html encoding. So, when we invoke Image() helper method from a razor view as shown below, the image is rendered as expected. However, if you modify the Image() method to return string of type System.String, the HTML is encoded and that's what is shown on the view, instead of actually rendering the image. @Html.Raw() method can also be used to avoid automatic html encoding. Notice that, the string that is returned by Image() method is passed as the input for Raw() method, which renders the image as expected. <%: %> syntax will automatically encode html in aspx views. So, the following will encode and display the html, instead of rendering the image. At the moment, the custom Image() html helper method is returning string of type system.string. If you make this method return IHtmlString, then the following code will render the image instead of html encoding it. videos on mvc or it was completed. Hi, there are more videos, which I will be posting very soon. Hi Venkat,i have a request..I want a program which extracts the zip file and also a program which downloads content from internet..its very urgent can u give me any suggestions on them..